Gain direct access to the Sanskrit verses – through the Bhagavad Gita. Learn the needed tools to evolve your life to a place of strength and balance. Develop proper pronunciation for select verses. Good pronunciation gives access to meaning of the verses. Practice Luminous Soul Gita Meditation to restore the mind to a peaceful natural state. Learn how to stand in your own inner warrior by applying the Luminous Soul principles realized through the Bhagavad Gita. Enjoy the joyful feeling of pronouncing resonant and healing verses from the Bhagavad Gita. Experience the harmonious circularity of sound. Enjoy Manorama’s playful & dynamic style of sharing the Bhagavad Gita as an entry point into the way of the inner warrior. During this workshop of personal and spiritual exploration combined with Bhagavad Gita study Manorama guides participants in understanding the notion of the Inner Warrior through the Bhagavad Gita. 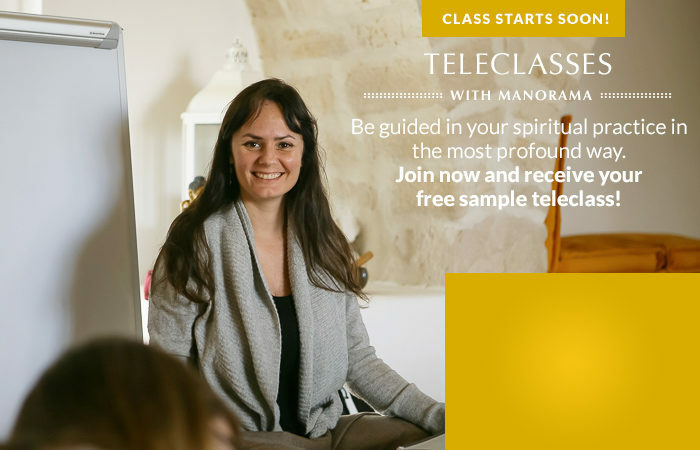 Join Manorama for this unique course designed to awaken the mind and heart of the individual in his/her quest for Sanskrit & Yogic knowledge. Learn to chant Gita verses with confidence, to practice Gita meditation and gain awareness of the principles of the inner warrior so you can incorporate them into your life. This course offers a new lens through which to view the vast and enlightening subject – the inner warrior through the Bhagavad Gita.